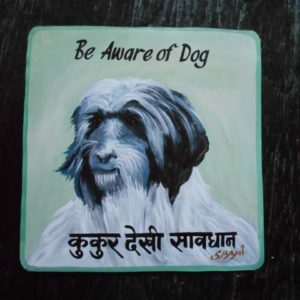 Wilson is a Tibetan Terrier, here hand painted by the artist Sagar, with loving attention to the background detail. 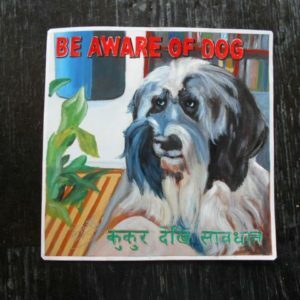 Wilson is a Tibetan Terrier, here hand painted by the artist Shahi. 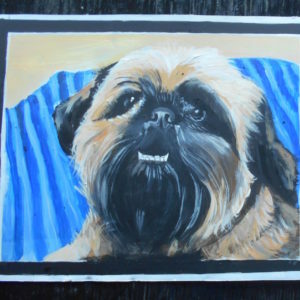 Winnie is winning in her portrait by Sagar Bitsa. He highlights her lovely eyes. 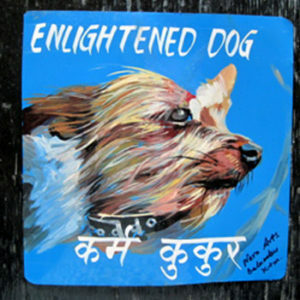 JK paints his charming and naive dogs on an extra large piece of metal. These are 18" by 18". 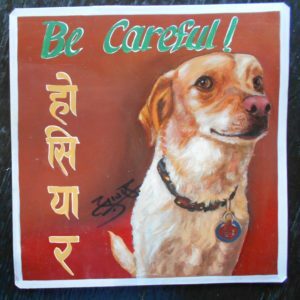 Ram Krishna hand painted this portrait of Red the Wolfhound with the classic Nepali sign painter’s motif of a circle around the figure. 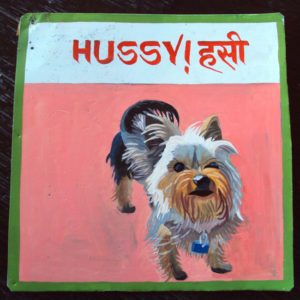 Shu Shu is a Yorkie who must have beguiling ways – her nickname is Hussy! 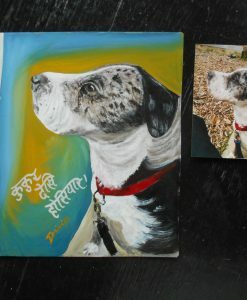 This hand painted painting on recycled metal is by Amar Shrestha. 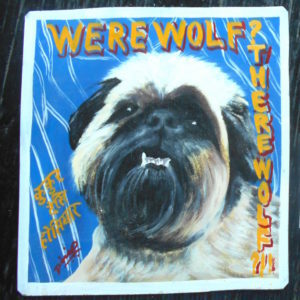 This Beware of Yorkshire Terrier sign is currently available at Nomad in Boston. Please contact them at (617) 497-6677, and they will be happy to assist you with your purchases. 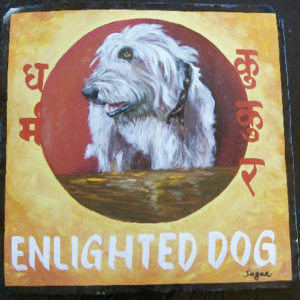 Their website is NomadCambridge.com. 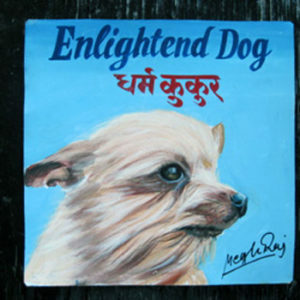 Chewy the Yorkshire Terrier is by Amar Shrestha. 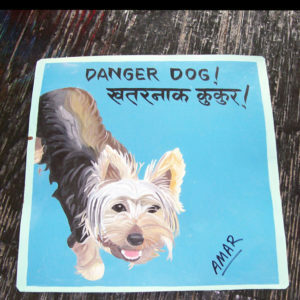 This hand painted beware of Yorkie sign on metal is currently available at Nomad in Boston. Please contact them at (617) 497-6677, and they will be happy to assist you with your purchases. 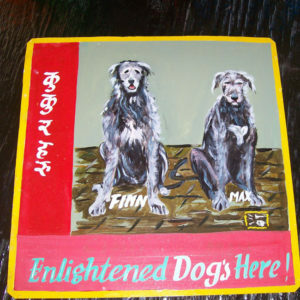 Their website is NomadCambridge.com. 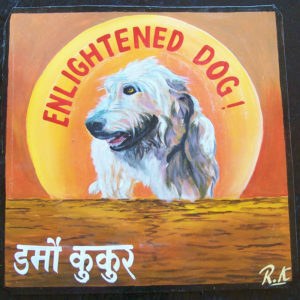 Baba hand painted this signboard of the Enlightened Yorkshire Terrier. 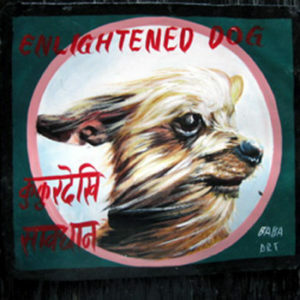 This handsome Enlightened Yorkie is hand painted on metal by Megh Raj Thapa. 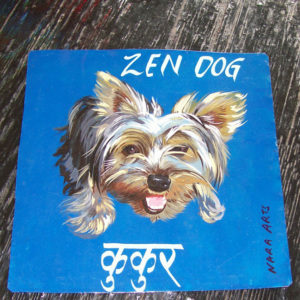 This Enlightened Yorkie was drawn from a photo that included a blurry blossom in the foreground. 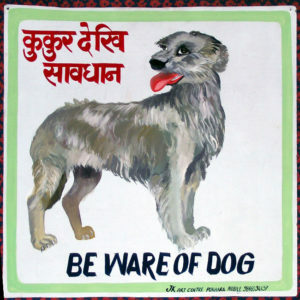 Nara did his best.